Congratulations on making it to 4 decades of your journey. Quite a feat it is. Not everyone reaches that far in their journey. 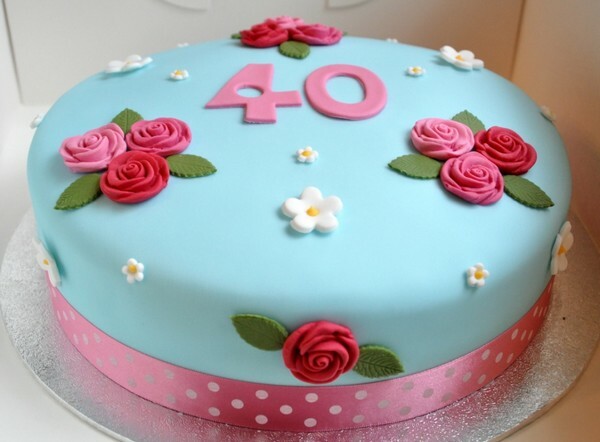 Being 40 means accomplishing many things in all aspects of life: family, career, experience and friendship to name a few. You can’t let this milestone go uncelebrated, right? Row, row, row your boat. There’s no greater way than to welcome your 40th birthday in luxury. Hire a boat as a venue for your party then sail to a river or sea. Make sure to check if one of your guests is sea-sick so you can sure that everyone will have fun. Great Gatsby. Best 40th party theme for men. Bring out that inner mafia spirit with this theme from the 1920’s. Ask the women to dress in their best flappers and pearls, while the men don their best suits for the event. Embellish the room with glitter and maroons for that mafia inspired setting. Cocktails and Glamour. You ought to have some bartending skills under your belt or you can hire a professional to mix you up your party cocktails for your 40th. Serve finger foods that will perfectly compliment the drinks and to top off the glamorous feel, ask your guest to dress in their best! The Classic Barbeque. Who doesn’t love barbeques? All you need is a grill, the perfect meat cuts, enough fire and your backyard! This laid back theme is pretty easy to throw, if you are not fond of the formal and glamorous party. A day of golfing. A day away from work, the hustle and bustle of the city and a trip to a golfing spot with the boys is surely a nice treat for your 40th birthday. Recharge in the club house with refreshments and sandwiches, you’ll be fully refreshed after this. A day with Dionysius. Wine is an item of luxury. Go for a wine tasting day with your friends. On your 40th birthday, indulge on the finest wines on your local winery; after all, you deserve all the luxuries on this milestone! What Happens in Vegas; Stays in Vegas. The glamorous nights in Vegas! The sound of the slot machines, the rustle of the shuffling cards, the light thud of the dices in the poker table and the bright flashing lights are enough to send your pulse racing with excitement. 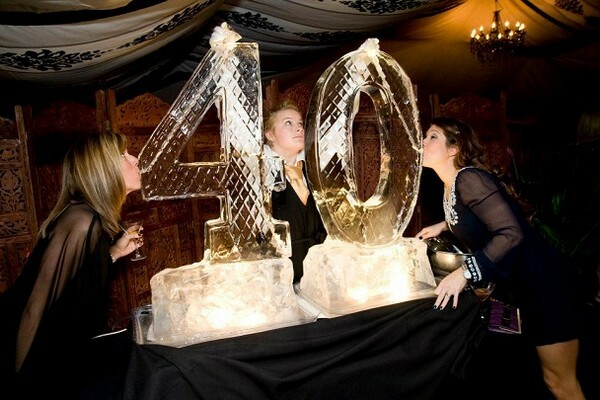 Bring that thrill and excitement into your 40th birthday party. Order gumballs in black and red, serve miniature cakes in shapes of dices and don’t forget the champagne! Ask your guests to come in their suit and dress. If you have a lot of budget, you can opt to employ the services of a casino night hire to complete the experience. Photo Slideshow of Memories. This is a good way of sharing memories with your guests. Ask your guests a few days away from your birthday, to send you photos of them with you. Compile these wonderful memories into a beautiful slideshow and watch it unfold during the party. The surge of nostalgia for the good times will sweep happiness and a pang of tears into the heart of your every guest. Checking-in. Invite your closest friends and spend a night brooding over the best moments you had together in a hotel. Indulge on the finest cuisines of the hotel’s café and drift lazily around the hotel’s pool. It’s okay to spoil yourself! You only get to celebrate your turning of 40 once in a lifetime, after all. Bowl it out. It could apply to any sports. Bowling is easier to host and everyone can play it. Rent 2 lanes at your local bowling alley for a day. Form 2 groups and outwit each other on a little bowling competition. Afterwards, you can replenish your strength at the bowling alley’s food court or have a scrumptious dinner at a restaurant or bar nearby. Outdoor Movie Night. Hang light bulbs around your garden, bring out a large table and adorn it with a beautiful mantle; Bring out your finest bottles of wine, popcorns of different flavours and other finger foods; Don’t forget the couches, comfy seats and a projector; select a classic movie that everyone loves and have the best 40th birthday night ever! Camping fun. Whether it’s by a real camp site or by a farmer’s field, there is nothing as adventurous and laid back as spending your birthday with your loved ones by an open fire. Bring barbecues to roast and some marshmallows too. Never too old for Carnivals. Everyone has an inner child in his/her heart. Relieve this youthful spirit with a vintage carnival birthday party. 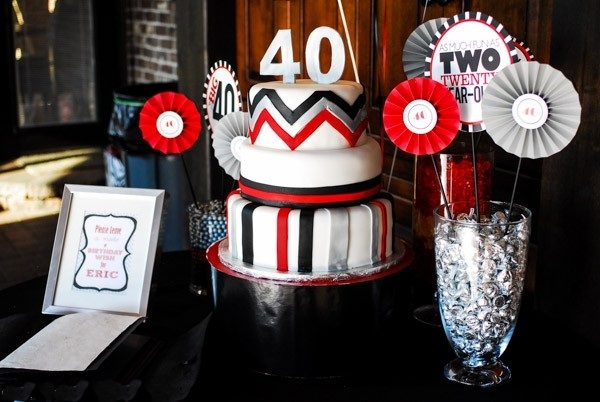 Revive those childhood memories with a carnival streamer and a carousel streamer atop your 40th birthday cake. There are wide arrays of food you can serve for the party. One of the best that will occasion is barbeque. Diamonds are a girl’s best friend. Welcome your 40th with an alluring jewellery luncheon party. Design the tables with sparkling beads for that glamorous effect. Place some cherry blossom branches on your vases and make the linens go with the overall ambiance of elegance by using beautiful soft pastel shades. Wiggin’ it. There is nothing like a fun and crazy party when wigs are part of it. Buy some neon coloured and bright coloured ones. There’s no harm in being silly at the age of 40. Hire a photographer or a volunteering relative for the event to capture all those happy and crazy smiles as well! Mary at 40th and her Secret Garden. If you want to throw an elegant party at the comforts of your home, then this theme will perfectly suit your taste. Take out your tables and mantles for some fresh air out in the garden. That fine china you’ve kept hidden for years in the comfort of your kitchen shelves are the perfect ensemble for your garden party. To add grace on your perfect set-up, make sure to choose 2 colours that will be the theme of your party. Finish it off with some fresh flowers as a centrepiece for each table. Rock Band. 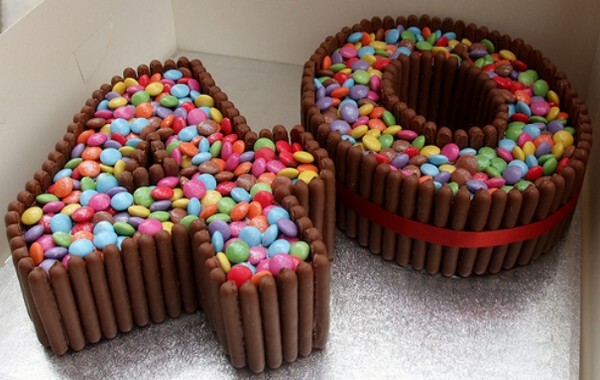 Why not spend your 40th at a local pub or dining hall? Rent it for the night and search for the perfect tribute band for the occasion. There are tribute bands for U2, The Beatles, Jackson, and the Rolling Stones to name a few. The Year 1975. The era of today’s 40 year-olds. It’s the year of teased hair, leather, shoulder pads and crazy awesome music! Let the music of the 1975 stream in your stereos and ask your guests to come in their best 70’s ensemble. Empire State of Mind. New York – such a wonderful city! Bring in that New Yorker spirit in your party. Embellish your dining room with party favours that scream New York – statue of liberty, high rise buildings, newspapers and the famous yellow taxi are some toppers or decors that you can put up around your house. Going Japanese. Go Japanese for your 40th for a change. If you have a passion for the culture and the food, then a Japanese themed party will be perfect for you! Dish out that tempura and show off your sushi making skills! For that perfect oriental touch, make Japanese paper crepe lanterns and use it as streamers for your party. A Japanese style party won’t be perfect without a cup of green tea and bowls of zenzai (Japanese shaved ice dessert) for a sweet ending. Match the design with the theme. Use Pinks and reds with black for the plates and the napkins. Use Cherry Blossom branches on a vase as table centrepieces. Gold, glam and glitters. Gold is the colour of elegance and allure. 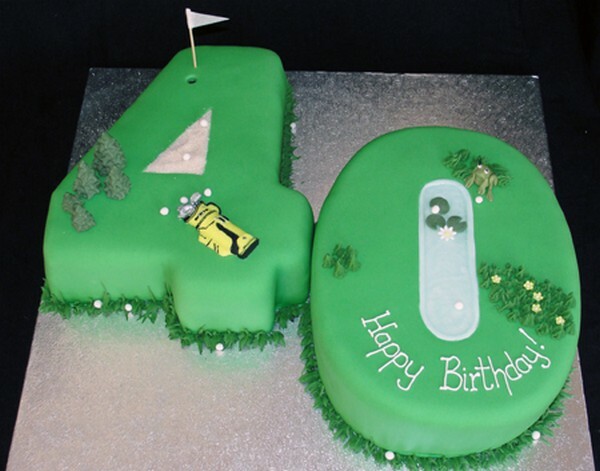 For your 40th, it is right to celebrate your birthday in luxury. Use gold cupcake foil for your desserts, gold mantles for your tables and perhaps add some sparkling golden champagne for that glamorous and glittering 40th birthday. 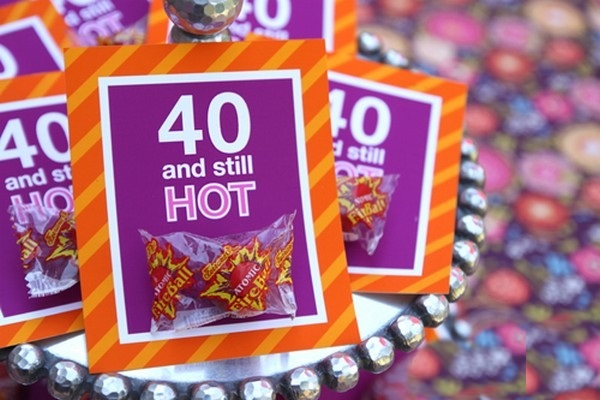 The perfect 40th birthday party favours. There are a variety of perfect party favours for your guests. You can opt for The Vintage Pearl as give away that will certainly surprise and bring delight to their hearts, as well as Gussy Sews with assortment of chocolates, facial masks, tea bags or put anything inside it that strikes your fancy. Bring the Magic On. 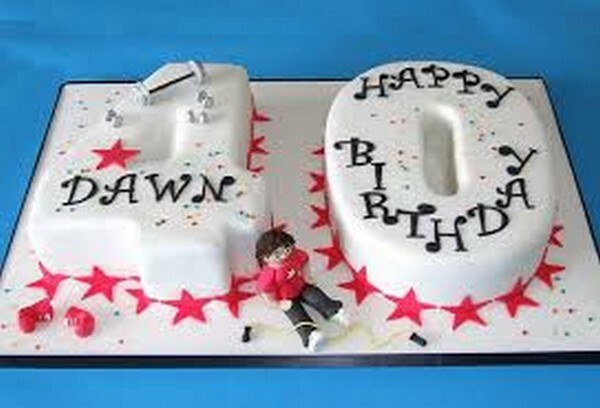 Your 40th birthday can be enjoyed by both kids and adults. Hire a magician to liven up the party. The first half of the performance can dedicated to the kids, and the 2nd half for the adults. You can also serve separate menu for the kids and set-up separate tables so that they can bond together. Beach Party. If the weather is perfect, then it is a wonderful idea to throw your 40th birthday party on a beach. The sand, the sea and the blue skies will surely make for a memorable 40th party. Ask everyone to come in their best summer outfit. You can also set up volleyball net and get everyone to play! Pair the theme up with refreshing juices and desserts to cool off the heat. Give Love on Your Birthday. The best gift you can give to yourself is the satisfaction and fulfilment of helping those in need. For your 40th birthday, choose your local charity of choice and spend a day making a difference. This will surely feed your soul like no other gift can. A day away from the City. Hire a big villa out of town. Invite your closest family and friends over and enjoy a weekend away from the fast paced lifestyle of the city. Bring over some barbeque and champagne and enjoy the vast twilight at night. Light up a bonfire and chat the night away. The best kind of party is spent with the people closest to your heart as intimately as possible.